Pastor Oswaldo’s church and SIFAT international teams built a new facility for an after-school program for the Puengasi community of Quito. Now, they are adding a computer lab for the children and youth to use. 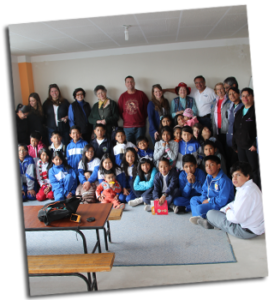 This project will provide a computer center at a poor Christian church for children and youth in an at-risk community in Puengasi, Quito, Ecuador. The lab will give the students who participate in an after-school program access to the internet to expand computer skills they need as they go on to higher levels of education or seek employment. It will also give them a place to have fun with computer games, offering an alternative to hanging out on the streets where drugs and alcohol draw children and young people in the wrong direction. By investing in the education and development of these at-risk children, the church, through Pastor Oswaldo’s leadership, helps them to break free from the cycle of poverty. Click on the button above to make an online donation to Oswaldo’s project. Please choose Project 19-4 from the drop-down list. You will be redirected to a PayPal processing page for Southern Institute for Appropriate Technology, SIFAT’s legal name.